Instagram is a free social network that was first published in 2010 and specializes solely in photos and videos that users can upload, edit, save and post. In addition to sharing your own content, you can also like other Instagram posts, comment on them or subscribe to other users. As a result, their content will appear on your Instagram homepage, the dashboard. Instagram also offers a messenger service and story mode. With the latter, photos and videos are automatically deleted after 24 hours. Why Instagram? This question can be answered rather quickly. Instagram has 800 million monthly users (source: CNBC), 90% of whom are under 35 years of age (source: Pennsylvania State University, College of Information Sciences and Technology). It is partly this young audience that is slowly but surely distinguishing Instagram from social networks like Facebook, where users are getting older. Instagram is regarded by many companies as the paradise for branding. Users are in constant contact with hundreds of companies and brands. You wouldn't be the first to create your employer brand on Instagram, and not without reason. Employer branding on Instagram makes sense - if approached correctly. 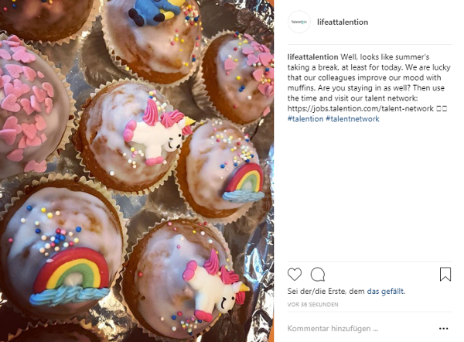 Once you decide to use Instagram for your employer branding, you face a big challenge: How do you build your employer brand effectively mainly with the help of photos? We have compiled several points for you to follow. For example, you can give a good impression of everyday working life by showing your employees in their working environment. So you should present your space to answer the question: Where do we spend most of our day? You don't necessarily need to have the best designed office here, but the workplace should make a positive impression on the users visiting your Instagram page. Your subscribers are interested in who is behind the company and, above all, how the employees are presented and viewed. Use posts to introduce individual employees with a portrait or snapshot. The small text next to the picture gives you the opportunity to share what the employee's tasks are, what they are working on right now or what they like in your company. You can just as easily dedicate posts to new employees, interns or trainees, in which you welcome them to your company. Do you have team events on a regular basis? Document them via Instagram. This shows your subscribers that your employees are appreciated and that they get along with each other and feel comfortable with you. Both strengthen your employer brand. Use Instagram to show the world and your target audience how much you and your employees support the company and the brand. Share pictures of your merchandise or have employees photographed in front of your logo. Many companies take advantage of this and post pictures that show their employees in their private environment with a connection to the company, whether they hold the logo in the camera or wear clothes with it on holiday. Companies that employees are happy to deal with outside of working hours will let your employer brand grow and draw others' attention to you. Instagram offers you the optimal opportunity to show the outside world which values are particularly important to you. So share pictures in which, for example, your team spirit or trust in each other are thematized. Whether this happens through spontaneous group pictures, the picture of the cake brought along or through pictures of small personal rituals between the employees, is up to you. The principle "quality over quantity" applies. It is better to choose the images carefully and consider what you would like to share with your target group and how it could contribute to building your employer brand. Don't underestimate the small texts you add to the pictures! Use hashtags and links to draw further attention to yourself. Be humorous and try out new things. Employer branding that doesn't take itself too seriously is highly valued on Instagram and by a young target group. Think about your username. Many companies decide here quite deliberately not to use the pure company name. Think about whether you put "team" in front of your name or "career". Employer branding starts before your very first post. 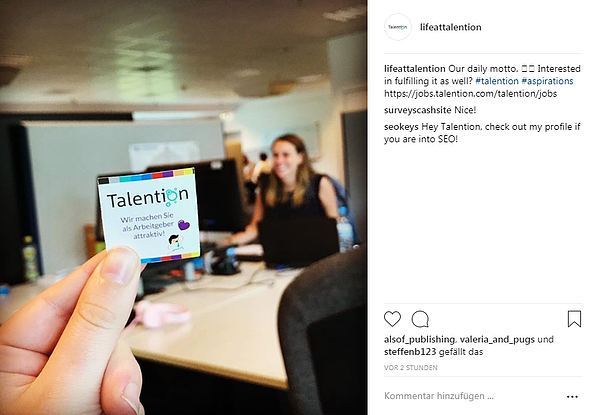 Our Talention team can now also be found on Instagram!